Meet Maddox, the great white shark making a name for himself as a swimmer. An exceptional swimmer since childhood, Maddox has made a name for himself off the coast of Mozambique since winning the regional great white Swimming Championships held in the prestigious Flamingo Bay waters in late 2016. His brilliant performances have seen him invited to the annual great white Southern African Championships in Gansbaai, where he will come up against the best white sharks from South Africa, Mozambique and Namibia. Maddox is recognized as one of the best swimmers of his generation and the media presence in Gansbaai is expected to be at fever pitch upon his arrival for his cold water training. This is an essential part of his preparation for the championships. Being a warm water local from Mozambique, acclimating to the conditions is key if Maddox is going live up to expectation and take the title. Should he win, Maddox will take part in the World Championships to be held in California in 2018 where he will come up against some of the fastest great whites in the world. 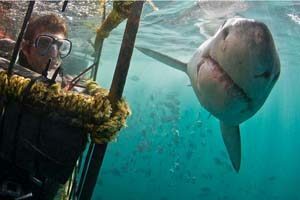 Great white shark tours offer a brilliant opportunity to witness these sharks’ athletic movements through the water. Catch Maddox as he looks to continue his impressive career on your next shark cage diving trip, book your shark trip today!